Following your excitement in this new century will lead you on the path of joy and the realization of your dreams. 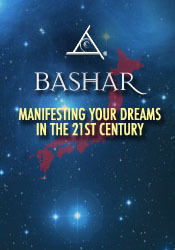 In this innovative workshop Bashar shares a future vision of Earth as a planet that is free from struggle and suffering and explores how you can experience that reality. Starting with the basic way that we interact with physical reality, Bashar describe the mechanisms that determine our experience of life and then shares a detailed technique for changing beliefs. The workshop includes exciting new predictions about changes in the 21st century in the areas of business, education, technology and communications. Why are we tested in life? Feeling resistance to loving yourself. Enhancing communication with plants and animals. Becoming a planetary consciousness and communicating with other levels of awareness. Using experiential techniques in education. Hardship in the Japanese economy. Using expectations in a positive way. Insecurity about trusting your choices. Needing to feel comforted in a relationship. The Threshold of Believability technique.